As you all know that SSC CGL 2016 Final result and marks has been declared and students are eager to know and proceed for nest step. 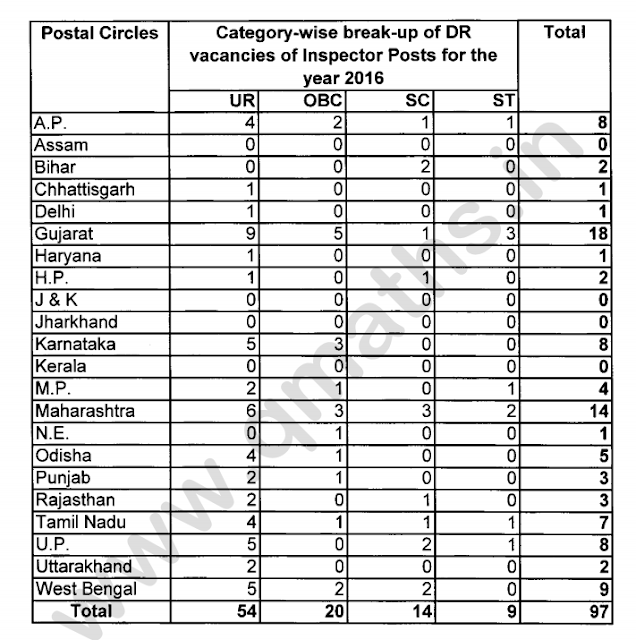 In this post we are sharing the Zone wise vacancies of Inspector Posts for SSC CGL 2016 which has been obtained through RTI by a follower of Qmaths. Team Qmaths thanks Shri Jay Meena who has forwarded this RTI reply to us. You may see the zone wise vacancies of Inspector of post for SSC CGL 2016 in the image below. Procedure after receiving Normalization from SSC upto final Joining of the Inspector of the posts. After receipt of nominations and dossiers of the nominated candidates from SSC for the post of Inspector Posts, the criteria for allocation of the selected candidates to various Postal Circles are decided. On the basis of so decided/approved criteria the candidates are allocated Postal Circles and their dossiers are sent to the allocated Circle. The appointing authority of Inspector Posts is in Postal Circle itself. Accordingly, Joining of such candidate is done by the appointing authority in Circles.